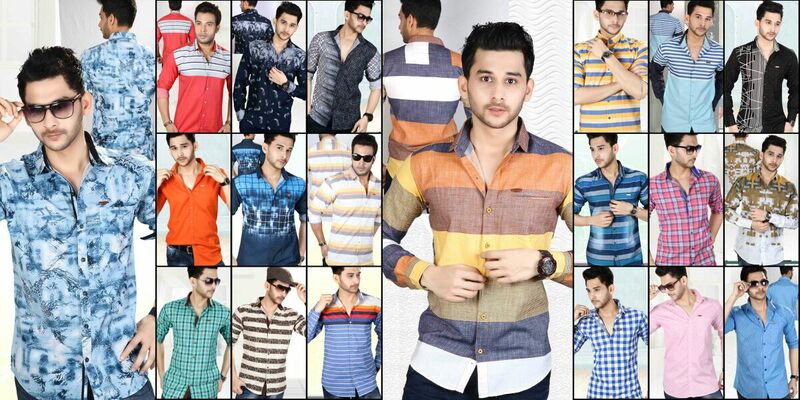 we are the leading manufacturer of #Casual Shirts in surat#. Please contact us for our product details. Shirt manufacturer In Surat.. Designer Blue Check Casual Shirts offered help in adding a touch of fashion statement in your dressing sense. Providing for superior wear comfort and stylish dressed looks, these men’s designer shirts are perfect to be worn during casual occasions like outings with friends and family. Here, our expertise lies in making this enchanting shirt collection available in wide choice of color, size and style combinations. Some of its features include use of quality fabrics to provide for comfortable usage, providing for soft and comfortable wear appeal, available in multiple pattern and color choices, available in different size options and others. call us on our Mobile number +91 9712250011 +91 9998534408 for further details. #SHIRTS MANUFACTURER IN SURAT# shirts are the basic wear for all men all around the globe. Its also equally important to select the color when you decide to dress yourself for the day. There are various combination of formal shirts and casual shirts which you need to pair accordingly. So we being into Manufacturing of Casual shirts we always try to experiment with various Designs and color combination which makes us the leading manufacturer of Casual shirts is Gujarat. we have our Manufacturing unit in Surat and we hold the top position in providing best quality and Designs in casual shirts , party wear shirts , half sleeve shirts , check shirts , party wear shirts , trendy shirts , trendy collar shirts and many more . so what are you waiting for come be part of our growing company and become our prime dealer of our product s. we are interested only in wholesale business so kindly visit our website www.t-zerr.com or contact us for more details or visit our factory.. IF YOU BELIEF IN CLASS WE HAVE THE DESIGNS. we are leading shirt Manufacturing company in surat having production capacity of 10000 shirts per month. kindly contact us for more information. COTTON SHIRTS MANUFACTURERS We are leading manufacturer of 100% cotton smart casual shirts. We have a small garment unit with best and latest Japanese technology of stitching with production capacity of 15000 shirts per month. We offer a wide range of Casual cotton shirt. This product is made up of 100% pure "Giza Yarn" cotton. The best cotton in the market. Styled for new generation, this product is hot selling in Indian market. Being one of the significant manufacturers and suppliers in the market, we offer a broad range of Pure Cotton Shirts . These shirts are manufactured under the expert supervision of our professionals using soft and skin-friendly fabric that is procured from the reputed vendors of the market. Since our main purpose is customer satisfaction we always belief in giving best quality products which have given us the reputation of best quality based casual shirts manufacturer. Pure cotton shirts won the struggle with synthetic fibers in formal fashion, Casual styles and never lost leadership in the premium segment of the shirts? Market. Due to natural-fiber qualities of pure cotton shirts are pleasant to wear and easy to treat. Pure cotton shirt is a fine garment for formal use, out-door activities and special occasions. We use such branded fabric in manufacturing of these shirts. These shirts are more valuable for summer season. Cotton Shirts are valued in Indian Culture. So it will provide rich look and pleasant personality. These Shirts can be availed in distinct colors and are manufactured from finest quality fabrics to offer a well dressed look. These Shirts are neatly crafted by our skilled artisans due to which these shirts are widely accepted by all of size 38"/40"/42"/44", Half and Full sleeves, plain and designed. Every piece gets washed with best kind of silicon and enzymes. Resulting into soft and handy feel with brighter looks. These shirts come in a set of four pieces in a very stylish non-woven pouch, with fancy tags with all details and printed M.R.P. We have over than 200 styles and patterns ready in stock always.